Today, my bestie is heading to Europe with her BF for a little vacation. She has been over there a lot in the past few years, and when she does I am always reminded of our trip to Europe. When we were 15, Erin’s mom took us to Europe for three weeks. (Brave, brave woman for taking two 15-year olds by herself) It was the first time I had been anywhere. And I can tell you honestly, it changed my life. I don’t think it’s possible to travel at that age and not be altered. 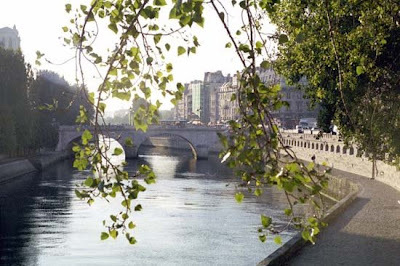 We went to several countries, but the place that really changed me was Paris. Oh Paris. Every single thing you’ve heard about it is true. It’s the most beautiful, romantic, glorious place I have ever been. Paris also happened to be the only day Erin and I were left to do whatever we wanted all day. It is my favorite day I have ever had, and I thought I would share the some of it with you. 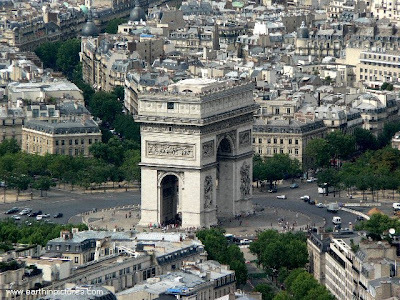 I remember that we climbed up the Arc de Triomphe, and we navigated the metro. We were free to meander down the cobble stone streets and act like we weren’t tourists. And that was the best part. 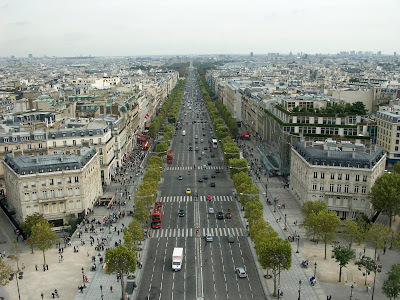 For lunch that day, we had been parusing the Champs de Elysees, and stopped for a baguette and pastries from street vendors. And we walked down a street and by happenstance found ourselves in this amazing little garden of trees. It was completely shaded, dark and cool. 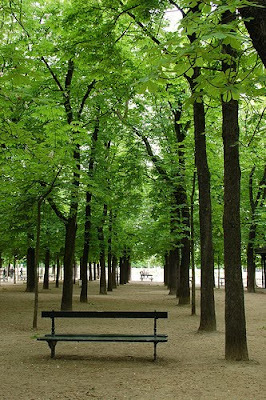 With lots of little picnic benches strewn about. We ate lunch under the trees in the shade. And I remember feeling really grown up, like I was getting a glimpse of what it was going to be like when we were older and got to become “grown up” best friends. I don’t remember what we talked about. Probably boys. We probably laughed a little to much, and a little to loudly. 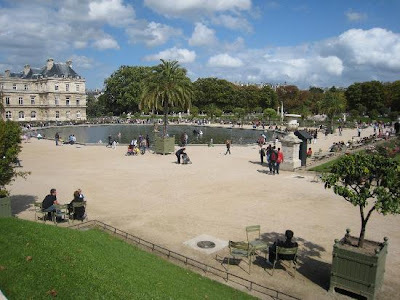 After lunch we walked into what we now know to be the main part of the Luxembourg Garden. Coming from the shade into the garden was like when Dorothy went from black and white Kansas to technicolor Oz. 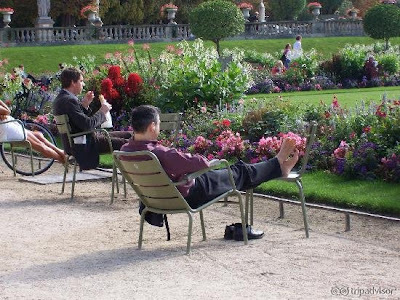 Parisian’s go to the garden to relax, pay pills, and read. 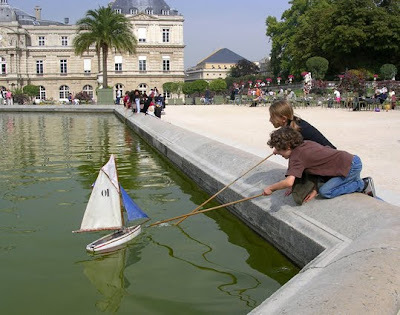 In the center of the garden there is a huge fountain with little toy sail boats you can push with sticks. You push it, and it floats around until it ultimately crashes into a wall. Our boat was yellow and was number 17. We kept trying to push the boat in the general direction of cute boys, so we’d have an excuse to run over to them, you know, to get the boat. After lunch we went to the Louvre and wandered the galleries for hours. We went a lot of places that were really amazing that day, but it is the garden that Erin and I remember the most. 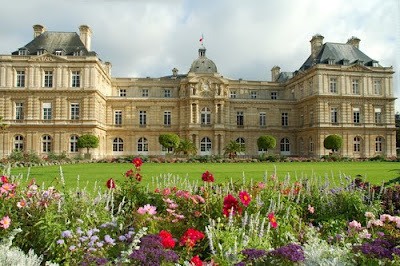 Erin has been back several times to Paris, but has never been back to the garden. She says that she always wants to remember the garden the way it was that day– and the way it remains in our memories. And I know that I would never ever want to go back either. It would assuredly lose some of its magic. Have a wonderful trip Erin. I love you so much and I am so very very lucky to have you as my best friend. I can’t imagine sharing these kind of memories with anyone else. 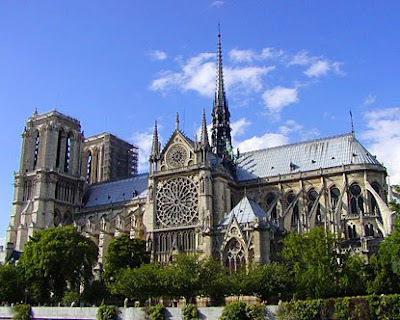 Ah yes, the Notre Dame Cathedral. The first time I ever heard Erin curse. That sounds amazing!! Especially that you guys are still good friends!! I haven't been to Europe yet, but I want to go so bad! gorgeous photos! sounds like a lovely time. i haven't been to paris… YET. But i will go someday. Previous Previous post: Pictures from Comic Con.. a.k.a. The Classiest Night of our Lives. Next Next post: Weekend Recap.